New York (January 11, 2016) – WorldStage continued its relationship with experiential marketing agency Zed Ink by providing audio and video systems for the fourth annual AWS re:Invent conference at the Venetian & Sands Expo Hall in Las Vegas. 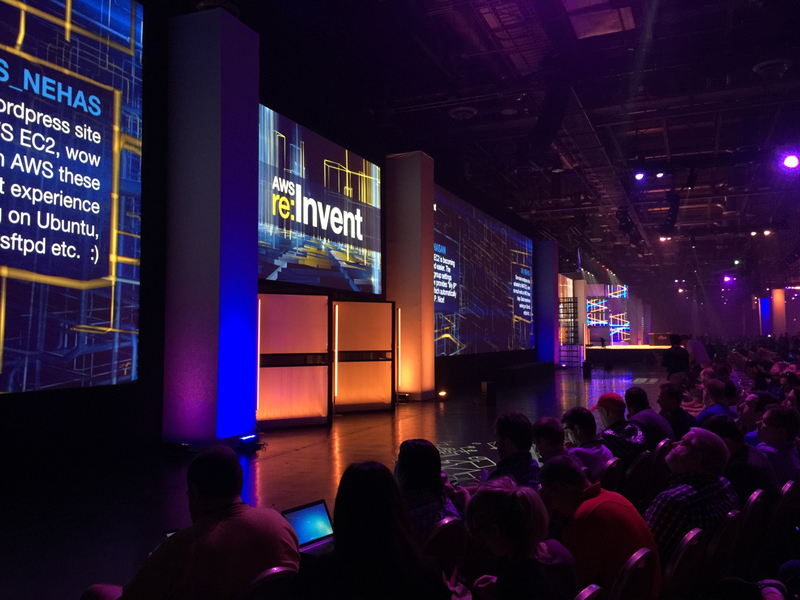 Crews from WorldStage’ East and West Coast operations combined to support two days of keynote sessions at AWS re:Invent 2015. AWS is the biggest public cloud currently available. The learning conference brought together AWS users of all skill levels to connect, collaborate and discover more about AWS by following different tracks, including big data and analytics, gaming, networking, storage and content delivery. AWS also packed the conference with announcements of new tools and services and provided a new growth metric: a $7.3 billion annual revenue rate. WorldStage programmer Alex Bright operated an extensive Dataton WATCHOUT 6 system for the conference – the first large-scale use by WorldStage of this major upgrade., Three Vista Systems Spyder X20 image processors were used for screen switching and to open up PIP windows on screen to display video modules, computer graphics supplied by the client and computer demos on stage. On the audio side, WorldStage provided a d&b audiotecknik distributed speaker system. “It was noteworthy for its distribution and size: over 20 points of sound throughout the hall says May. The company also supplied a Yamaha CL5 console with Dante network system and a Riedel intercom system, which took advantage of its point-to-point programming for individual communications.